I also get the "running command 'K.par' had status of 127" message after running the K20 calculator file. However, since I can run the Dodecad Euro 7 par file without issue using the same standardize 23andme format, i.e. copied script from saved file for both K20 & Euro 7 runs so no manual edits, I do not believe in my case that this script is the culprit. This is only my second DIY calculator attempt, however, so I will try a few more for comparison. I keep getting this error when I try to run the source('standardize.r') I saved all the files in the appropriate folder as shown on step 1 and also changed the directory. 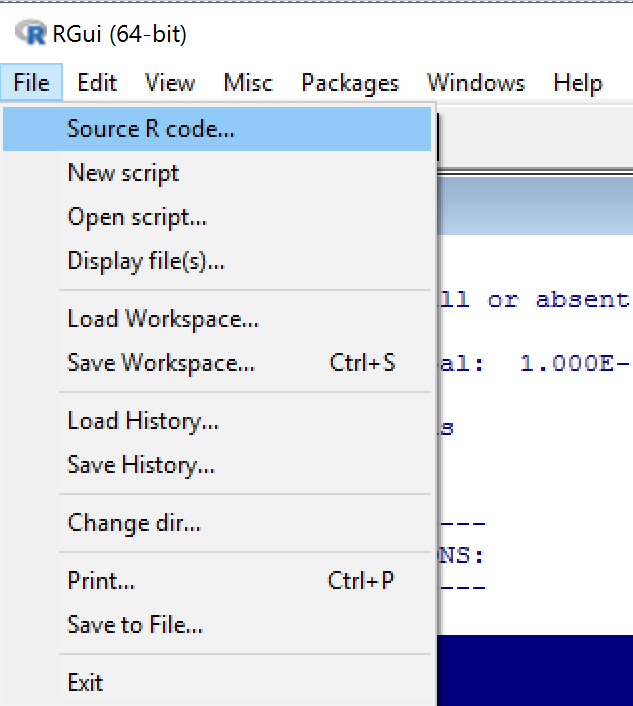 Try loading the R file from the menu, if you are using the RGui program, and not in command prompt. There you can just select the R file you want to load from the menu. This error happens usually when the par file isn't specifying which chromosomes to read (ie. 1-13 or whatever). (At least in my experience). So the par file reads whole genome and with 23andMe genomes there is MT and Y data. So in that column it doesn't see an integer, like "2", it sees "MT", and it doesn't know what to do because it is expecting an integer value to read. What you can do to make it work is after standardizing the file, open "genotype.txt" (this is the standardized output file that will be read by the par file). Click Edit > Find and Replace. Find "MT" Replace "0"; Find "Y", Replace "0"; Find "X", Replace "0". Save. Run the calculator. It should work. Last edited by khanabadoshi; 09-26-2016 at 11:34 PM. You have to type it separately. Has this error changed or something. I've tried with my 23&me DNA - doesn't work, same error as AnnieD mentioned. We replace all MTs, Ys, and Xs right? The one Balkan quoted on the first page still works. This must be something different. The MT/Y DNA error doesn't happen with FTDNA data because the raw files only have autosomal data, no MT/Y data. Which calculator are you trying to run? I can try running it for you. EDIT: I was incorrect. Status 127 doesn't have anything with the integers -- that is another error. Status 127 means that the PAR file or DIYDODECADWIN is not on the PATH, and thus, not visible to R to use. Most likely, the PAR file and DIYDODECADWIN.EXE files aren't in the same directory and/or that directory isn't the set Working Directory? According to the last link, if the path C:/DIY or whatever has a [space] in it, it can lead to a Status 127. ie. C:/Khana/DIY FILES/k20.par -- maybe changing the folder name to DIY_FILES [C:/Khana/DIY_Files/k20.par] will solve this issue. Last edited by khanabadoshi; 10-26-2016 at 08:12 AM. If it comes to that sure. Got it to work last night - tried it before work today and the silly thing continually reset to the "start" no standardize.r when trying to continue with entering my 23&me information.